Ramona Brazilian Jiu Jitsu’s competition team made another strong showing at the recent So-Cal Golden State Grappling X championship tournament in San Diego, bringing home 11 medals. All competitors fought hard and were great sportsman on the mats, making coach Kevin Hosseini proud of his team. 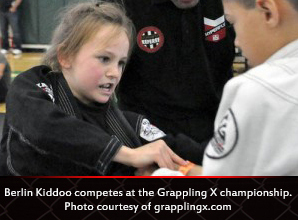 In the kid’s divisions, Savannah Kiddoo and Matthew Mendoza both took first place. Theron Puyot and Nathan Kiddo both took second place. Emily Leyva pulled out a third place victory. In the adult division, Dani Taylor, Raul Leyva, and Isaac Rorholm dominated their divisions and took first place. Jay Friend Sr. took second place in a tough division. David Werhanowicz moved up to the adult division and took a second place finish. Jiu jitsu tournaments are full contact competitions. The fighters start from a standing position and use techniques to take their opponents to the ground where they use leverage and proper technique to control and submit with chokeholds and joint-locks.